Snow may be in the forecast, but that doesn’t mean it’s too early to plan your backyard swimming pool. Winter is the perfect time to get started on your dream pool, because it allows ample time for planning. An important first step of this exciting journey is determining what’s feasible for your backyard, based on several factors identified below. So the sooner you start these steps, the sooner you’ll be enjoying your new backyard paradise when temperatures heat up again. 1) Site visits: Let’s go over the possibilities! Our experts will come to inspect your backyard for things like size, layout, grading and drainage. We’ll discuss what needs to be done to ensure your pool will be safe, properly installed and in compliance with local zoning regulations. We’ll also go over pool style options, shapes and sizes. 2) Permits: Most municipalities require a permit to begin pool installation. This helps to ensure your pool is built safely and that it meets local code. We’ll help you with the permit process and keep you in the loop about any inspections required by local officials. 3) Utilities: Your backyard will also need to be inspected for any utility lines that might interfere with the installation, such as electrical, gas, septic or water lines. Don’t worry if you have utilities in the way! We’ll work with the utility companies to relocate these lines away from the pool site. 4) Grading and drainage: Your backyard may need to be graded to ensure the proper slope. Without the right grading, a level pool installation will not be possible, and you’d also run into drainage problems whenever it rains. Our experts will go over everything during the site visits, so you know exactly what needs to happen before installation begins. 5) Excavation: Now the real digging begins! We’ll begin excavating your backyard to make room for your pool. Our teams will conduct ongoing transit checks to ensure the correct pool depth and levelness. 6) Construction: This is where your pool literally begins to take shape. 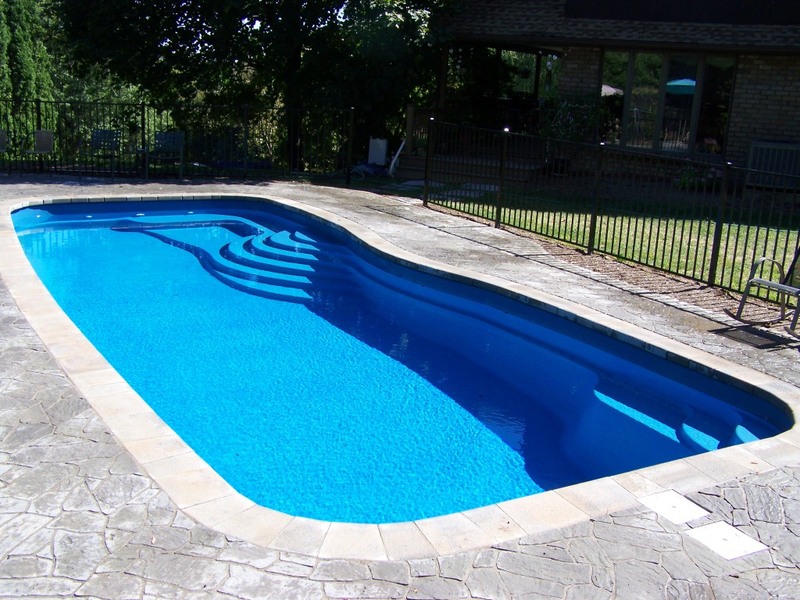 For vinyl liner pools, our experienced installers will begin building the shell, strengthening it with braces and concrete around the perimeter, backfilling and grading the surrounding area before the liner is installed. The entire pool construction itself is usually finished in about 21 days (for liner pools). We keep you informed throughout, so you know how everything is coming along. 7) Fencing & landscaping: For safety, all backyard pools must be surrounded by fencing, usually at least 48 inches tall. Additionally, you’ll want to consider ways to enhance your paradise with the proper landscaping. These steps are part of the overall planning and installation process, and our experts at Crystal Pools will discuss your options from the very beginning. Our customers have peace of mind knowing that we stand by our pools and our workmanship. Only Crystal Pools provides an Exclusive Lifetime Structural, Non-Pro Rata Warranty, on the steel wall components of the pool with Crystal providing ALL materials, labor, and cost. Ready to start planning your swimming pool for this summer? Contact us today or stop by our Crystal Pools locations in Hershey, Lancaster or Mechanicsburg. Proudly serving all of Central Pennsylvania, including Hershey, Lancaster, Mechanicsburg, Harrisburg, Carlisle, Camp Hill, Hummelstown, Elizabethtown, Lebanon, Manheim, Lititz, and York.